Power your 5V DC devices from your computer through a USB port. Tired of having to carry around a separate wall adapter in order to power or charge your 5V devices, such as certain external hard drives, streaming media players, and Bluetooth speakers?This 2m USB power cable makes it easier to power 5V DC devices that have a Type H (OD: 3.4mm, ID: 1.3mm) barrel power connector. You can power or charge the devices through an available USB port on your laptop or desktop computer. 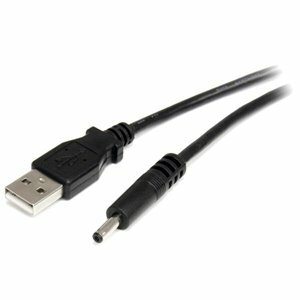 This 2m USB power cable makes it easier to power 5V DC devices that have a Type H (OD: 3.4mm, ID:1.3mm) barrel power connector. You can power or charge the devices through an available USB port on your laptop or desktop computer.